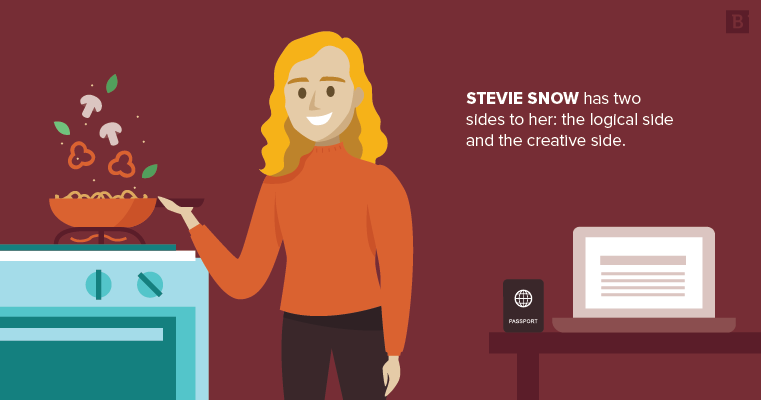 Stevie Snow has two sides to her: the logical side and the creative side. While some people prefer to focus on one or the other, this content writer has always preferred combining these two ways of looking at the world. “I love the idea of being creative and strategic and working all these brain muscles to get to the desired result,” she explained. That’s why she decided to major in advertising at Boston University: it was the best of both worlds. But even though she knew she wanted to do something related to advertising, she wasn’t quite sure what her focus would be – until she took a copywriting course. I love the idea of being creative and strategic and working all these brain muscles to get to the desired result. From that day on, she was determined to embark on a career centered around writing. When she graduated from Boston U in 2017, she took a copywriting internship at an advertising agency, then started doing freelance writing gigs while she looked for full-time work. It wasn’t long before Brafton popped up on her Glassdoor feed. She filled out the application and began her first day that October. Stevie took to the content writer position right away. She loves being able to learn something new every day – it keeps her days interesting, and she never gets bored. At the same time, she loves immersing herself in a client’s brand and voice to create impactful content that reflects their messaging. It’s rewarding when you get to know a certain client really well and it’s easy to write for them. Her hard work has also won the respect of her peers and other people throughout the company. The trust she’s earned has meant project managers and other colleagues feel confident recommending Stevie for a unique client or project. In one case, a managing editor chose her for a client that had a history of being picky about their content, knowing Stevie’s close attention to detail and ability to learn quickly made her a great fit for the account. So, what does it take to be a good content writer? According to Stevie, it’s one part quality, one part quantity. Getting up to speed requires honest communication with others on your team, sound organization skills and an awareness of what you’re capable of. “You really have to understand your own writing process to know how long it takes to do something and can plan out your days accordingly,” she explained. Stevie values honest communication in all parts of her life, and she brings that priority to work. When she has a question, she asks it. When she needs more information to write a piece, she says so. Stevie includes that honesty in her writing style, too. Stevie’s love of learning and creativity follow her outside work, too. Stevie loves to travel, cook and paint, and she strives to visit at least one new city every year. Brafton’s flexible work environment makes this easy; she can work from home when she needs to, which helps her plan endeavors accordingly. Authenticity is so important in marketing, so I try to bring that into my writing. One of her favorite activities to do outside work is experiment with new recipes and flavors. She and her friends come from different backgrounds, so they share their favorite foods and recipes with one another. Stevie’s signature dish is spaghetti bolognese, though she also loves melting cheese over a plate of roasted veggies. Stevie’s family is British and Jewish, while her roommates come from Japan and the Southern U.S. Together, they come up with delicious meals to enjoy.